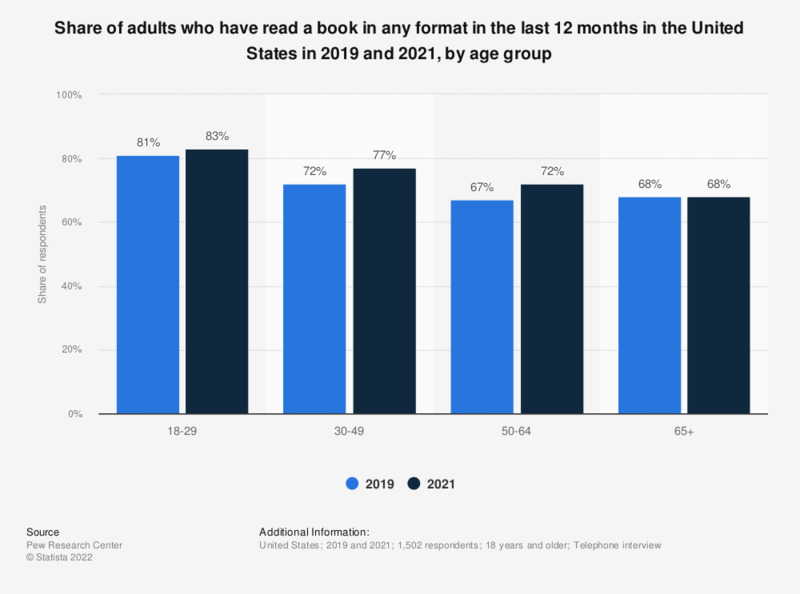 This graph presents the share of adults who have read a book in any format in the last 12 months in the United States in 2018, by age. During the survey, 67 percent of respondents aged 65 and older stated that they had read a book in any format in the previous year. While it is mostly believed that book reading is a vanishing pastime, particularly among Millennials, surveys among consumers in the U.S. have shown the opposite. The share of book readers in the U.S. has varied from 72 percent to 79 percent between 2011 and 2016. In regards to age of book readers in the country, a 2016 survey shows about 80 percent of respondents between the ages of 18 to 29 had read at least one book in the previous 12 months, the highest share amongst all age groups. About 73 percent of the respondents aged between 30 to 49 years old said they read at least one book in the last 12 months. The share among respondents between 50 and 64 years old stood at 70 percent, whereas 67 percent of respondents aged 65 plus stated reading book during the time measured. In terms of education level, book readers in the U.S. are more likely to have a college degree, or at least some college education – 86 percent and 81 percent respectively. Women in the U.S. read slightly more than men; 68 percent of male respondents started reading at least one book in the previous 12 months, against 77 percent of female respondents that said the same. Despite the rise of digital platforms and the rising popularity of e-reading devices such as Kindle, Kobo and others, printed books still remain the most popular book format in the U.S., as 65 percent of Americans stated preference for printed books in 2016. E-books were consumed by 28 percent of respondents in 2016, whereas audio books were listened by 14 percent of the respondents. Millennials accounted for the largest share of printed book readers in the U.S. – 72 percent as of 2016.